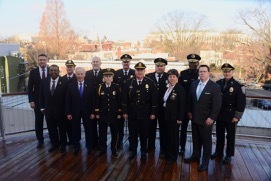 The IACLEA leadership met with Members of Congress and their staff on March 6–7, 2019, to raise critical issues and share valuable expertise on public safety policy matters during IACLEA’s annual Capitol Hill Day. The Board of Directors and Executive Director Sue Riseling, joined by several general members, met with more than 50 U.S. Representatives and Senators or their legislative staff. The Association strategically prioritized meetings with lawmakers on committees with authority over key issues and freshmen lawmakers, to educate them on campus public safety issues early in their tenure. 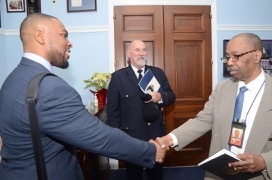 Officer Sean Collier Campus Police Recognition Act of 2019 (H.R. 816), which would make federal public safety officers death benefits available to the families of sworn law enforcement officers employed by private colleges and universities. Private institution personnel are currently excluded from benefits coverage. Bipartisan Background Checks Act and Background Check Expansion Act of 2019 (H.R. 8 and S. 42), which would make it unlawful to sell or transfer a firearm in any transaction without a background check. Proposed Changes to Title IX Regulations on which IACLEA asks Members of Congress to thoroughly review the US Department of Education’s proposed changes to Title IX and assess its future impact on institutions of higher education. IACLEA analyzed and submitted comments on the proposed changes. See the Government Relations page for more information. 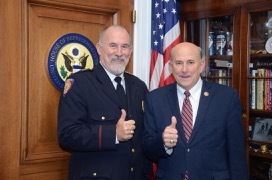 “Capitol Hill Day is a wonderful opportunity to educate federal lawmakers about the issues relevant to campus public safety,” said IACLEA Immediate Past President David Bousquet, chief of police at Becker College. “Each year we make strides in advancing policies that improve campus public safety. “With effective regulations and appropriate resources, campus public safety leaders can further enhance the exceptional work we do every day to keep our nation’s higher education campuses safe,” Bousquet said. The day began with a briefing for Congressional staff. 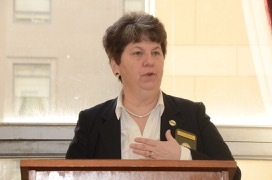 Executive Director Sue Riseling presented the IACLEA legislative agenda. Other panelists included higher education partners: Teri Hinds, director of policy research and advocacy for NASPA, and Abigail Boyer, interim executive director of Clery Center. In addition to the Board, IACLEA members Michael Murphy, Government Relations Committee chair for the Association and assistant director of security at Rockefeller University in New York City, and Captain Andrew Turco, Massachusetts Institute of Technology Police Department, participated in the daylong event. Turco was a friend of Officer Collier and joined the campaign to pass the legislation named for Collier. Officer Collier is featured in IACLEA's Officer Memorial Video, which was played during the Congressional Briefing. Please consider joining this important event next year! Read about Capitol Hill Day 2018. If you would like to be part of this outreach or have issues you would like carried forward, please contact Altmann Pannell, apannell@iaclea.org, or call (202) 618-8118.